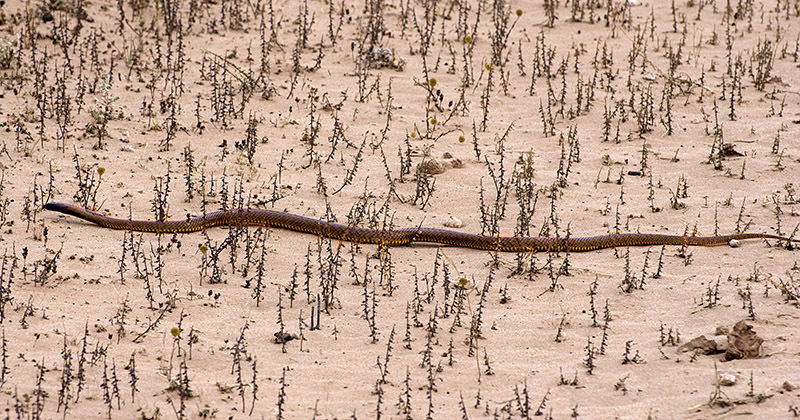 The Eastern Brown Snake (Pseudonaja textilis)is one of Australia's most poisonous snakes. It is quite common and lives in eastern and central Australia as well as in New Guinea. They are especially common in agriculture areas because their favourite food is mice. It is responsible for around 60% of snake bite deaths in Australia but doesn't bite unless cornered or trodden on. They mostly try to hide. This one was over 2m in length, so quite large, and was moving quickly away from me. Very good picture of this dangerous snake! Australia is known for its dangerous snakes and spiders. A country that I would like to visit someday to photograph its fauna, but at the same time I'm a little afraid because of how dangerous are some of its snakes. Congratulations for the photo and thank you for sharing it.